While Qantas is currently pushing international flights with its commercial partner Emirates, on the domestic front it’s axing direct flights from Cairns to Alice Springs and Darwin. Sources at the airline told ABC News last night some flights on those routes to the Northern Territory were “virtually empty”. Qantas has also cut five weekly flights from Perth to Alice Springs and four from Perth to Darwin. The moves will hit tourism morale in the Northern Territory, which is digesting recent data from Tourism Research Australia for the financial year ending 30 June 2018. 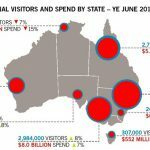 The figures showed that the Northern Territory was the only state or territory other than Western Australia to register a fall in international visitor numbers and spending. The NT saw international visitor numbers fall by 7% to 283,000 and spending dive by 15% to AUD 411 million. At the same time, domestic overnight trips grew across the rest of the country but fell by 11% to the Northern Territory. Qantas is reportedly adding two weekly flights from Darwin and Adelaide to Uluru, a new discount program for Alice Springs residents flying to Darwin and extra Jetstar services from Cairns to the NT. On the international front, both Malaysian Airlines and Philippine Airlines have dropped flights to the NT over the past two years – but Jetstar Asia recently announced it would increase the number of regular services between Singapore and Darwin from four to five per week. Jetstar Asia partnered with Tourism Northern Territory to celebrate 10 years of flying the route, with a special livery depicting scenes from the Top End. MEANWHILE, Qantas has put the spur to its partnership with Emirates, with a special “earn double points” offer on eligible Qantas and Emirates operated flights with a QF flight number until 11.59pm (AEDT) this Friday 16 November 2018 for travel between 1 December 2018 and 30 June 2019.